Barry is a 5" roly poly fellow who is created by me by a wrapping of wool over a wire and styrofoam base. He holds a broom and a little cardinal on a bed of evergreen. He is strung for hanging as an ornament. Barry is brand new for 2011. 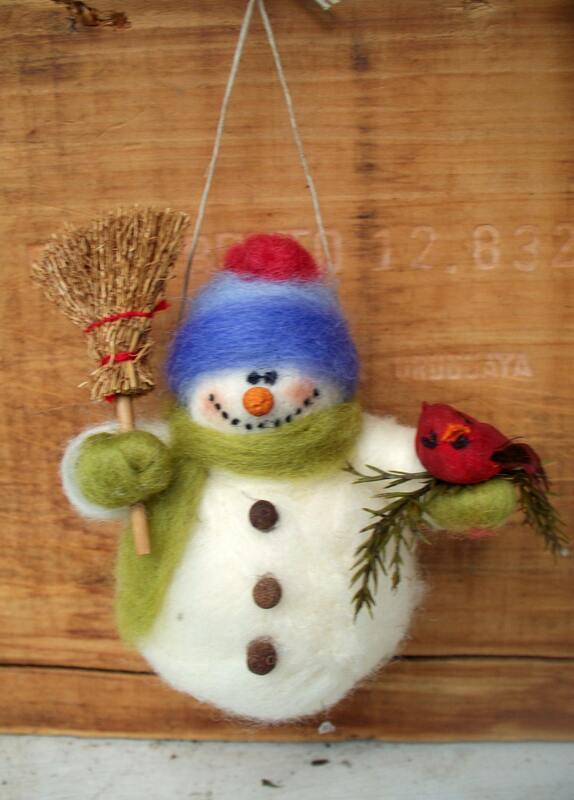 Pretty Pockets Felted Wool Snowlady - 10"
This snowman is adorable and beautifully crafted! Quality workmanship. Was somewhat disappointed that the colors of hat and mittens were not as pictured. Do not hesitate to order these great ornaments! Well made. Ordered early, but did not receive by Christmas. Seller did stay in touch. Your business is always welcomed but in fairness to those who order any product or products from me you need to understand this. An order is not placed until payment is made. As soon as payment is made that is when I have received the order. If you are not happy with what you have received I will accept returns as long as the return is within 10 days. When I receive the package and if there is no wear or tear on the product I will issue a full refund for the product only. I try to ship each order in a timely manner. If I feel that I need to have more time to accomplish an order I will let you know. Sometimes this will happen if I am away from my work desk, if I am out of a certain component that I need to complete an order, or the amount of orders that have come in are very heavy and I need more time. IMPORTANT...because of issues in this day and age with packages being stolen off of porches...once package has shipped and it has been delivered to the address given by customer, I am no longer responsible for package. So please make sure that you have someone standing by once I have emailed you that the package has shipped to retrieve package. Here I am at work in my wooly room. Booth shot at one of my shows.